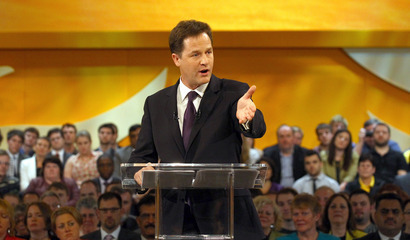 Nick Clegg of the British Liberal Democratic Party, chose yesterday to forgo the stage for his leader’s speech at the Party Convention and to instead speak from a little round podium that had been placed in amongst the audience. He spoke quite literally in the round, with people all around him. Was this a good style for conference speaking? It was a horrible, horrible mistake for anyone performing a keynote. If an organizer ever suggests it to you, fire them immediately and get someone who knows what they’re doing. We want leaders in both politics and business who look like they’re capable of striding the world stage. To speak from a little raised podium makes you look more like the guy conducting the village band in the park on a Sunday afternoon. While speaking from “amongst the people” might appear to create a nice contrast to the big staging of the big political parties, the contrast fails because here it merely suggested that the Liberal’s are a little party. The corollary thought to this is that they are a little party, with little ideas. And having merely little ideas they are all the more likely to be shoved-around, sat-on, and eventually sliced-off by their far larger and more aggressive coalition partners, the Conservative Party. Golden rule of speaking: Always look at your audience. Speaking “in the round” like this guarantees that at any given moment, there are a chunk of them that you can’t see. If you do ever find yourself in a position where you have to speak in the round, then one approach to still being able to look at the whole audience can be the Square Dance. Rather than revolving on the spot, which looks odd, the speaker moves through the four points of a square. It’s walk two steps, speak 60 – 90 seconds. Walk two steps to 90 degrees, speak 60 – 90 seconds, and repeat. Just be careful with your movements. Get the timing or direction wrong and you fall off your platform. For Nick Clegg however, the Square Dance wasn’t an option. The TV cameras were the true target audience, and because they were all pointing in one direction, the speaker had to do so as well. I don’t know how Nick Clegg felt about having all those people behind him, but had I been the one speaking, they would have been making me feel mighty uncomfortable. To speak from the floor and achieve that amongst-the-audience feeling is a tremendously powerful technique. Don’t throw away the stage though in attempting to achieve it. Keep the stage. Come down from it. Stand immediately in front of it. And keep the whole audience, immediately in front of you.